A brown cow is boring. We’ve all seen thousands of brown cows. But a Purple Cow, now that would be something quite remarkable. We would remember seeing a Purple Cow. In 2002, famed entrepreneur and marketer, Seth Godin introduced us to the idea of the Purple Cow in his book, Purple Cow: Transform Your Business by Being Remarkable. Although a living, breathing Purple Cow is ridiculous and belongs in a category with flying pigs and unicorns, the idea of a Purple Cow is quite brilliant. It will transform your business. So, what is a Purple Cow? In a nutshell, a Purple Cow is an idea, product, service or brand that is remarkable. The fact is, most businesses aren’t remarkable, which is why so few are tremendously successful over a long period of time. Most businesses are brown cows. There’s nothing wrong with being a brown cow. You can still experience success as a brown cow, but your business will be largely invisible. Most people can’t buy your product. Either they don’t have the money, they don’t have the time, or they don’t want it. If an audience doesn’t have the money to buy what you’re selling at the price you need to sell it for, you don’t have a market. If an audience doesn’t have the time to listen to and understand your pitch, you’ll be treated as if you were invisible. If you can find a Purple Cow, it will transform your business. 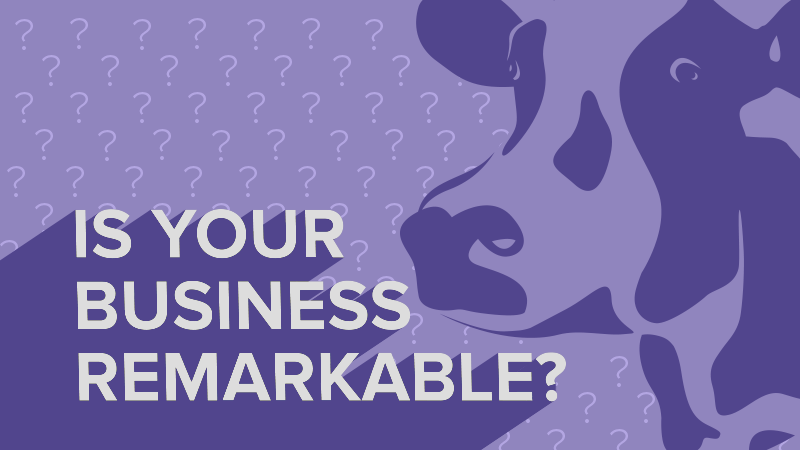 Here are some ways you can find a Purple Cow and make your business remarkable. Note from the author: The key assumption of Godin’s book (written in 2002) is that advertising is broken and is no longer as effective as it once was. This is the reason why he believes your business must be remarkable to standout. I disagree with this assertion, but believe every business can benefit by trying to be remarkable. 1. Don’t be afraid of failure. Most of us are not trying to be successful. We’re trying not to fail. We’ve all been conditioned to fear failure. In school, getting the wrong answer was punished by low grades, scolding and contempt from teachers and classmates. We worked so we wouldn’t get the answer wrong instead of working to get the answer right, which are two very different things. Whether you want to admit it or not, this fear of failure still effects our decision making as adults. Ironically enough, the fear of failure is why a lot of businesses do ultimately fail. Telling yourself not to be afraid of failure is a hell of a lot easier said than done, though. How can you actually do this without years of intense psychotherapy? One of the easiest ways to get over your fear of failure is to embrace criticism. Start looking at criticism as a positive thing instead of a negative one. Criticism does not lead to failure. What some people may view as risky and reckless (and they’ll certainly let you hear about it) could actually be a remarkable idea. If you listen to everyone’s criticism and make changes to quiet some of the loud voices you will be left with an idea that’s watered down and unremarkable. You’ll be boring. Michael Jordan, considered by many to be the greatest player in NBA history, has failed over and over again. On game-tying or go-ahead field goals in the final 24 seconds of the fourth quarter or overtime of playoff games, Jordan has missed (and cost his team the game) nine separate times. He’s also won the game by making nine of these shots. Michael Jordan is remarkable. It’s okay to miss (and fail), but never be afraid to take the next shot. It could be your Purple Cow. 2. Don’t follow the leader. If you’re following the leader, then you’re following the path of something that’s already been done and that’s about as unremarkable as it gets. If you want your business to be remarkable, then you have to become the leader at some point. You don’t always need to be the leader, that can be exhausting, but you have to be the leader long enough to be noticed. Godin points to the Aeron chair as an example of how an unconventional path can be remarkable. We can all agree that desk chairs are pretty unremarkable. I sit in one each and every day and I can assure you that mine is as unremarkable as it gets. The Aero chair, the official chair of office hockey. About 20 years ago, furniture manufacturer Herman Miller decided that it wasn’t going to let the desk chair remain unremarkable any longer. In 1994, Herman Miller took a radical risk by introducing the $750.00 Aeron chair. This is an insane price for a desk chair if you ask me, but it worked. The chair was funky, quirky and pricey, but everyone who saw one wanted to sit in it. You don’t need to hire engineers and manufacturers to come up with a revolutionary product for your business to be remarkable, but you should always question how and why you’re operating your business a certain way. Dare to be bold. Being unconventional might just help you find a Purple Cow. 3. Try to be the best at something. Just be the best. This seems like blatantly obvious advice, but it’s not. Don’t be the best at everything. Be the absolute best at one thing. It doesn’t matter what industry your business is in, by being the best, it will give your audience something to talk about. Jimmy John’s doesn’t have the best-tasting subs, but it will deliver you one faster than anyone else. Jimmy John’s is the fastest. IKEA sells cheap furniture, but it offers you a brilliant combination of form and function for an affordable price. IKEA is the most innovative. Hotels.com isn’t the most comprehensive travel website, but it does promise to find you the best deal on a hotel your location. Hotels.com is the most obvious choice for booking a hotel room. You don’t have to have the newest product or the lowest price to be the best, but you do have to carve out your own niche. Embrace the niche. Never try to make your business appeal to everyone. It can’t. It won’t. If your business is for everyone, than it’s for no one. Take a look at your business, your products and services. What do you do exceptionally well? What are you known for? What do customers really like about you? Take what you’re the best at and get better at it. Obsess over it. Make your employees obsessed with it. Tell your customers how obsessed you are (just don’t sound like a crazy person). Market this idea. Adapt your business plan around this idea. Always push yourself to improve. Have unwavering dedication to be the best at (fill in the blank). Maybe you offer the best customer service in your industry or you have the best happy hour beer prices in the city. It doesn’t matter the idea, it just matters that you obsess about being the best at something. Your business can still be really good at doing other things, but you have to be the best to be remarkable. You have to be the best to have a Purple Cow. Go find your Purple Cow. Running a successful business is extremely hard, but you want all of that hard work and effort to pay off don’t you? I suggest that every business owner read Purple Cow by Seth Godin. You can order the book here.